In this tutorial we will paint a head with a marble map. This sounds easy to do with typical max mapping and texturing tools, but a lot of good known artifacts like seams, visible tiles and diferent map scaling come around and make things a little bit harder! PowerStamper lets you stamp any bitmap into your object to produce a global bitmap, without seams, where tiles are unnoticeable, and where all the zones look with the same scaling. Open the file BigHead.max and select the BigHead Object. Go to the utilities panel and open the PowerStamper utility. Click the Stamping Image button and set the bitmap BALMORAL.JPG as the stamping image. To produce a more clean result, set the angle end value to 50.0. Click the Output Bitmaps button, in the dialog box click the Set Output Bitmap button and create a new bitmap named 'BigHead_marble.tga'. Set its size to 600 � 400. 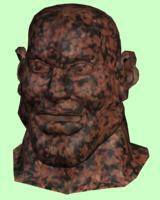 Everything is now set, and we just need to start stamping our new 'BigHead_marble.tga' bitmap! In the materials editor, set BigHead_marble.tga as the diffuse map for the BigHead material and turn on Show map in Viewports. Rotate the camera about 30� around the BigHead object and click the Stamp button again. After the bitmap is stamped, the viewport is updated and it shows you which parts still needs to be stamped. Rotate the camera and stamp the BigHead until you cover all the areas of the model. Some zones, like behind the ears or below the chin, may be harder to map, but for sure in less than 3 minutes you can have all your 3D model stamped. As with any mapping solution, one of the most important things is how much area a texture face covers in the texture map! In other words, how many pixels in U and in V can a face render. If a face is very thin, or very small and it just covers one pixel, the texture won't look good even if it was stamped or painted with a 3D Painting application. This is why it is very important to apply a good mapping to your 3D model and for this you can find UVW Frame very useful because it can let you detach and reorganize your mapping mesh without worring for tiling problems, which are solved by PowerStamper. To obtain a more random result, you can use a camera viewport to stamp the object, and you can change the roll value and the distance from the camera for each stamping process, or you can leave the camera fixed, and just rotate the object. And to get even more random results, you can use the Noise modifier, and just change the seed value before every stamping process.